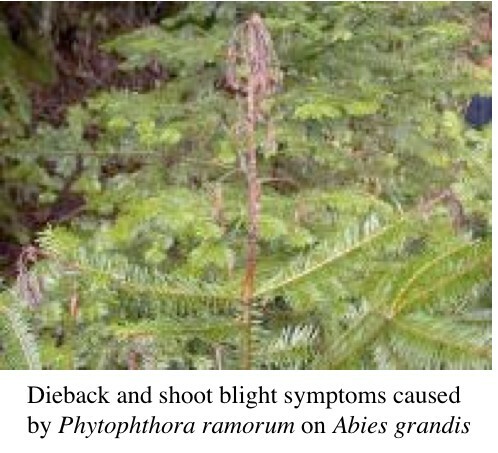 The antheridium is said to be amphigynous when it encircles the oogonial stalk, a condition brought on by the growth of the oogonial initial through the antheridial initial. Compare with paragynous. The male gametangium; a multinucleate, swollen hyphal tip affixed firmly to the basal side of the oogonium. Not filled up. 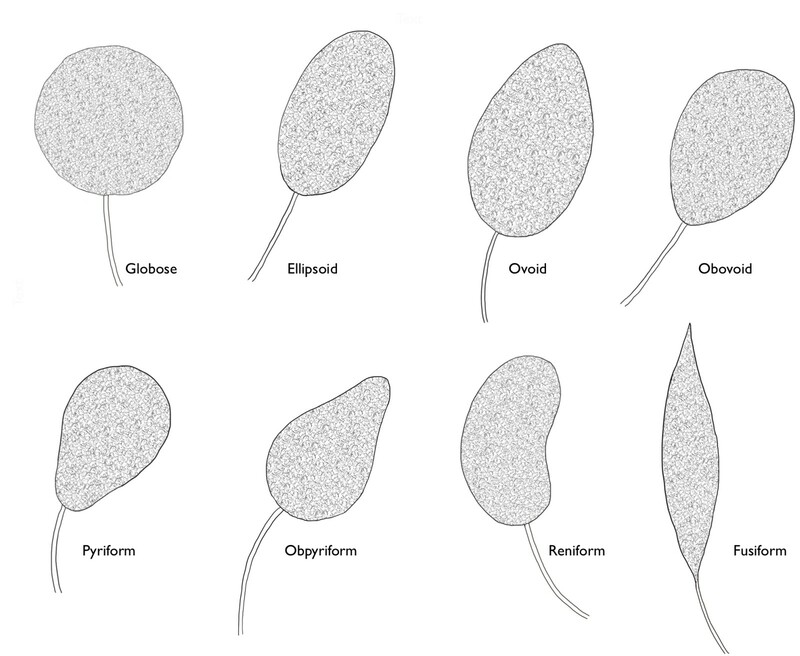 Refers to species of the Pythiaceae in which the oospore does not fill the oogonium. Compare with plerotic. Pertaining to sporangia that become dislodged readily and separate from the sporangiophore (in contrast to being persistent). An asexual spore, usually globose but occasionally ovoid, that is delimited from the mycelium by a septum; may be terminal or intercalary with a thickened inner wall; survives for long periods in soil. A population of clonally reproducing individuals that descended from the same ancestor. 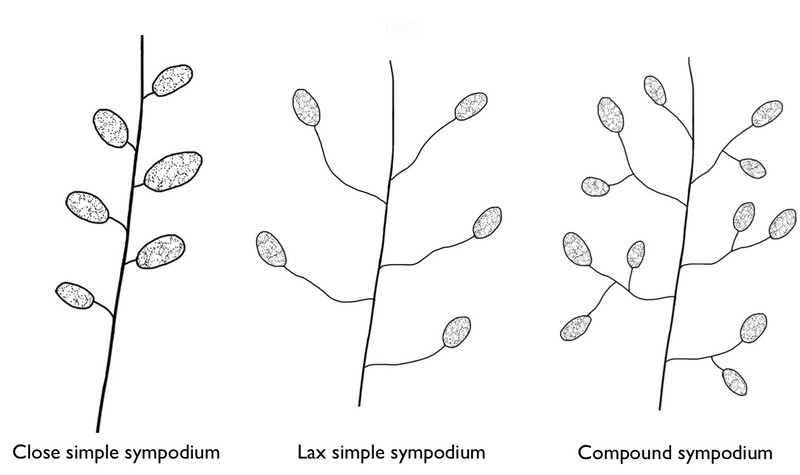 A simple sympodium in which the sporangiophores are very short. 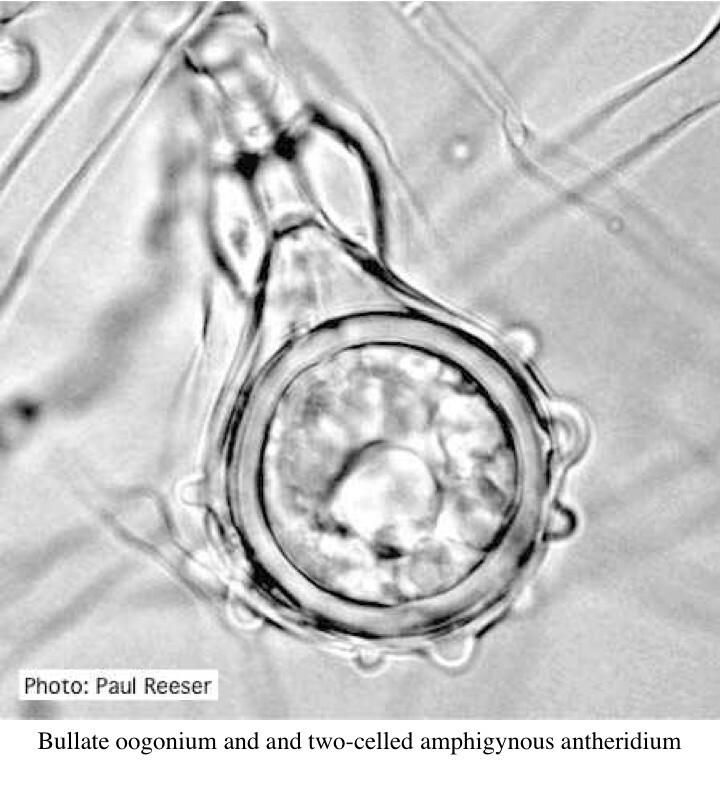 A clustered sympodium has short sporangiophores as well as short nodes between them. The portion of the seedling or plant near the surface of the soil; in grafted woody plants, the scion portion of the plant near the soil surface. 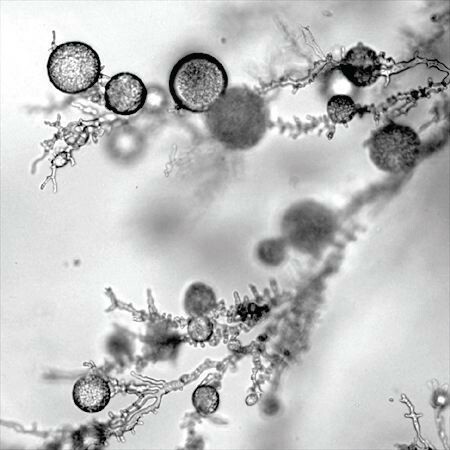 A sympodium with a branched hyphal system from which the sporangiophores initiate, can be irregular or regular. Cf. simple sympodium. 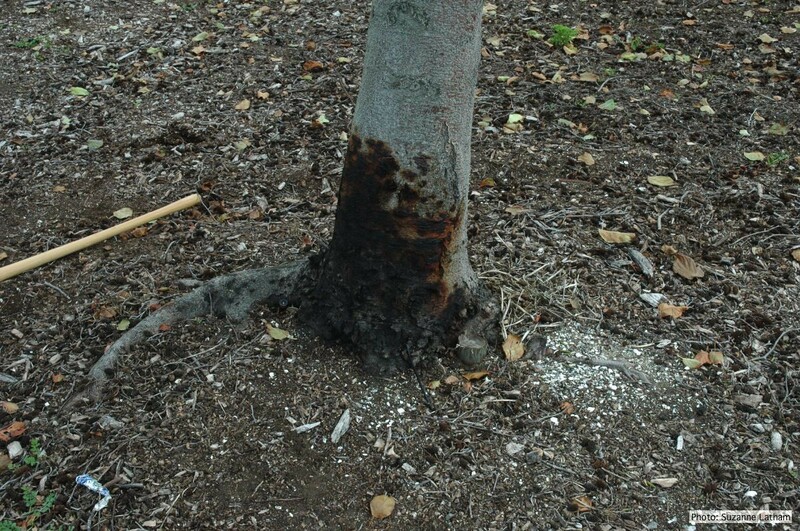 The junction of root and stem of a plant, usually at the soil line; in grafted woody plants, the rootstock portion of the plant near the soil surface. 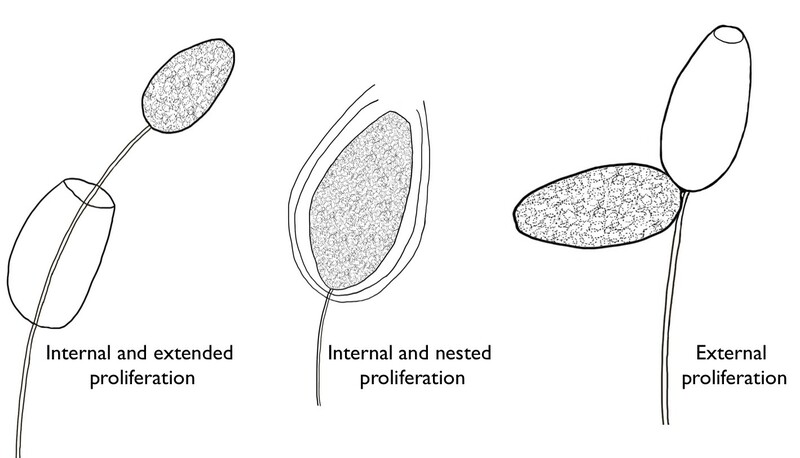 An encysted zoospore, a short-lived resting structure enclosed within a cell wall. 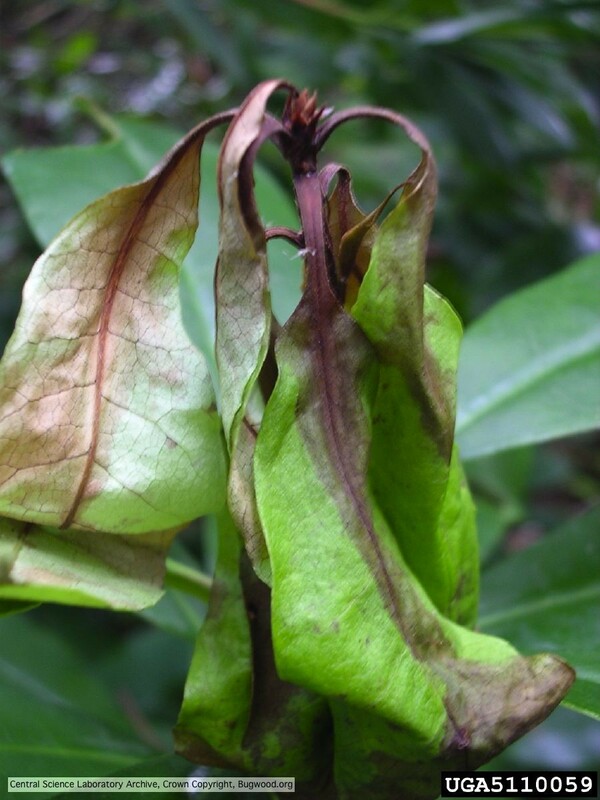 Plants are unthrifty and fail to grow, or the canopy may become “thin” due to loss of foliage. This is a gradual process that may take place over a period of several years. 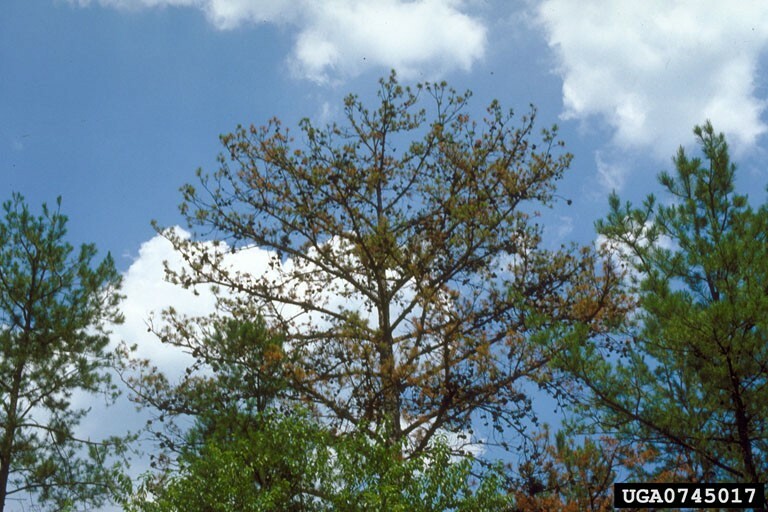 Progressive death of shoots, leaves, or roots, beginning at the tips. Refers to a solid body that forms an ellipse in the longitudinal plane and a circle in cross section. 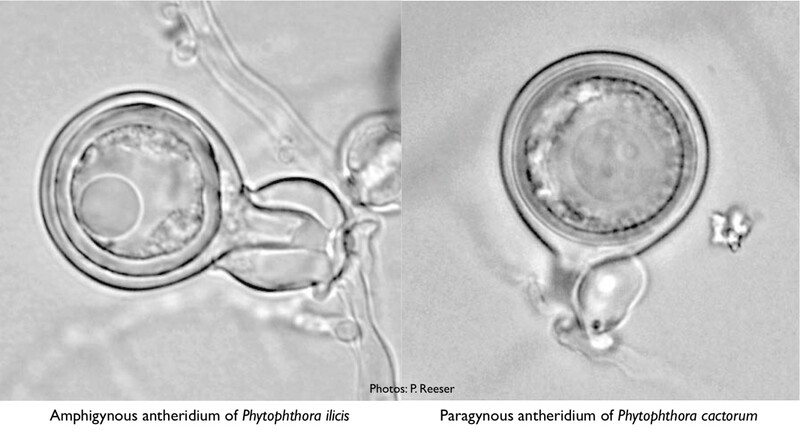 Many fungal spores are ellipsoidal or elliptic. 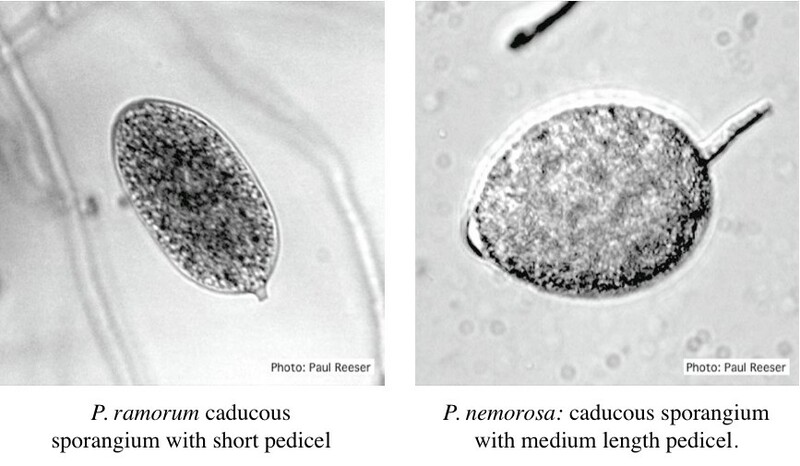 The opening through which zoospores pass when leaving a sporangium; papillate and semipapillate sporangia have exit pores 5 to 7 µm wide; the exit pores of nonpapillate sporangia are about 12 µm wide. 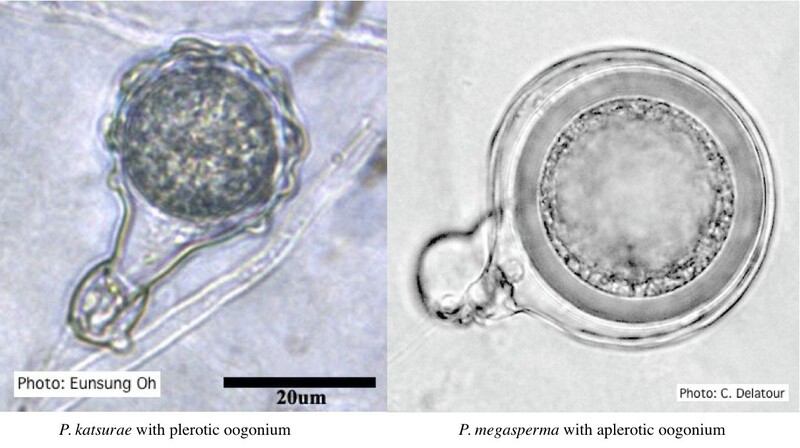 A type of internal proliferation in which the sporangiophore originates inside an empty sporangium, and continues to grow through and out of the old sporangium. 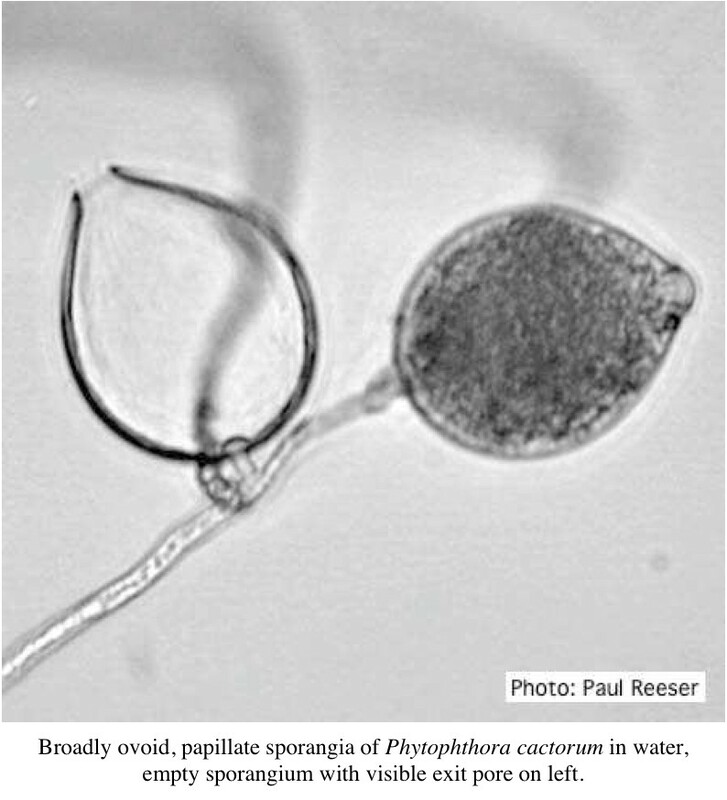 External proliferation occurs from growth of a sporangiophore from beneath and external to a sporangium. Cf. extended proliferation. 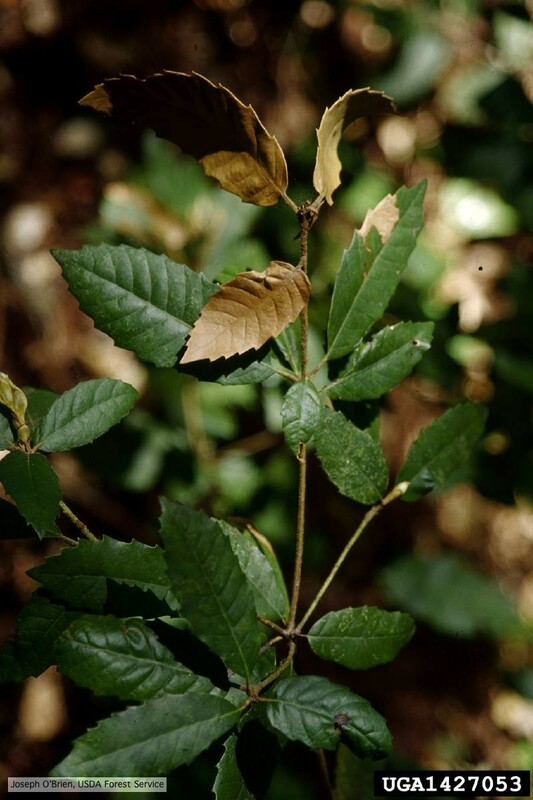 Isolated, wilted or necrotic branch with dead leaves attached. Spindle-shaped; tapering at each end. To have a rounded form resembling that of a sphere. Pertaining to sexual reproduction in which mating is possible only through interaction of different mating types. Pertaining to sexual reproduction that can take place without the interaction of two different mating types. 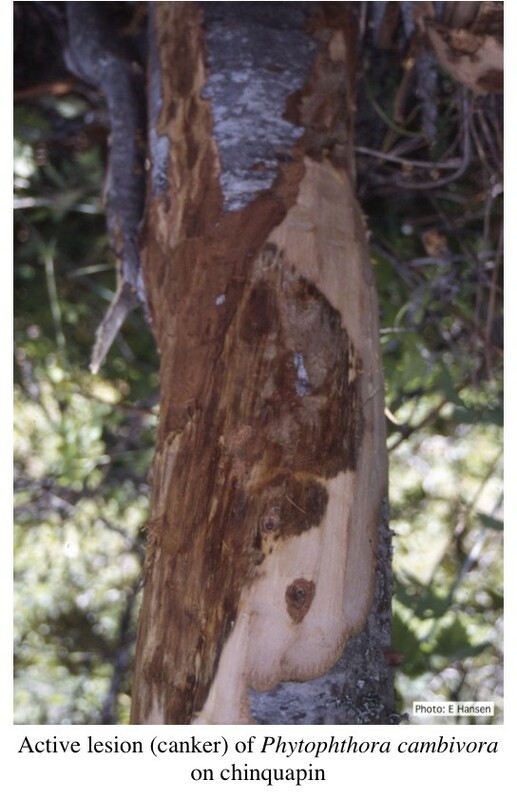 Globular swelling that forms at a branch point or within the mycelium. 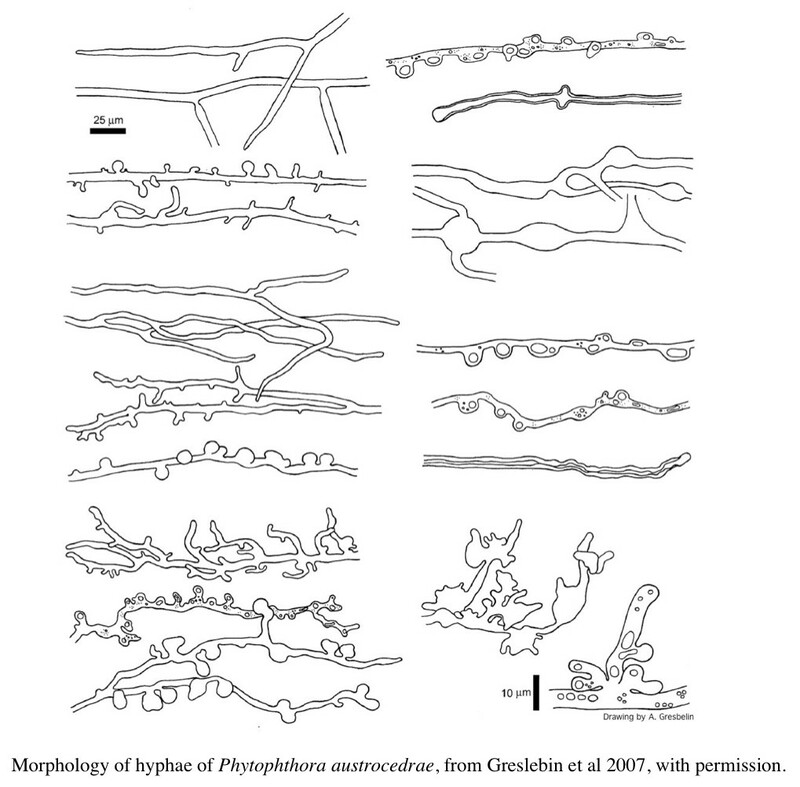 It is by definition (Blackwell 1949) not separated from the coenocytic mycelium by a septum. 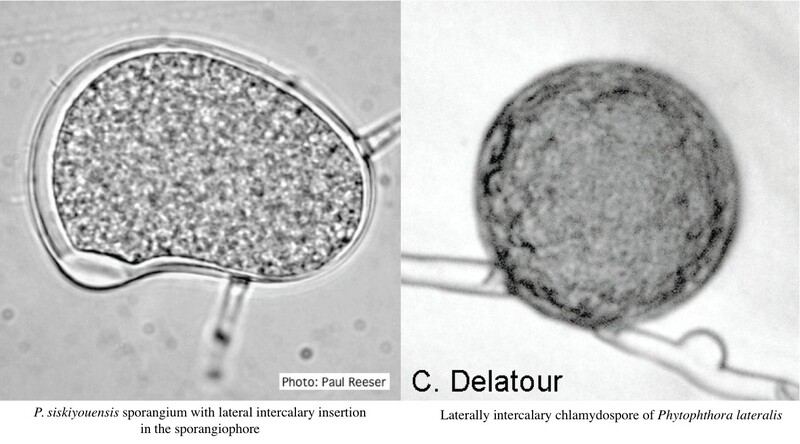 When separated by a septum and having a thickened inner wall, it is termed a chlamydospore. Positioned within a hypha, not terminally. 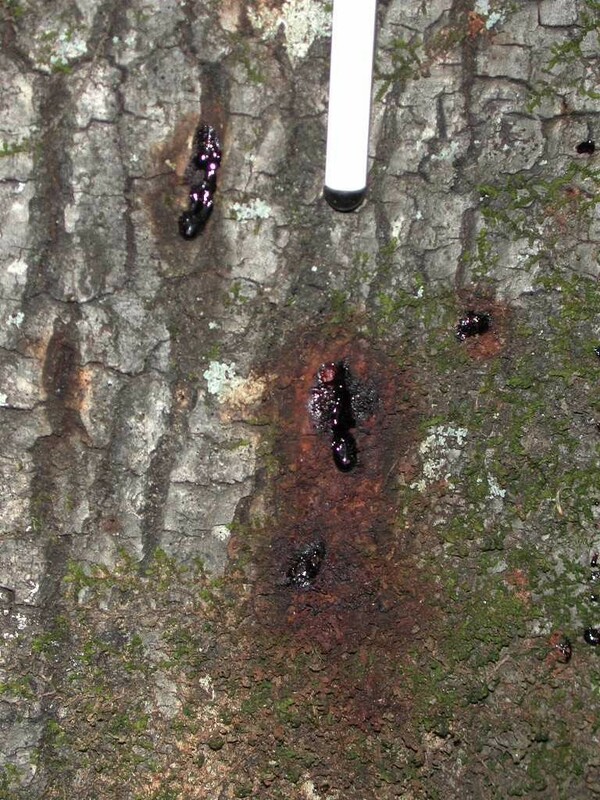 Internal proliferation occurs when the sporangiophore continues to grow through the empty sporangium. A sympodium in which the sporangiophores are long and loosely arranged. Compare with close sympodium.